Earlier this week I noticed several genealogy patrons looking at city directories. Have you tried finding your ancestor in such a directory? 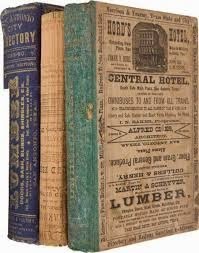 Larger cities often had city directories which contained lists of businesses and residents, sort of like a phone book except that you didn’t have to own a phone to be included in one. This is a real plus for the late 1800s and early 1900s when many households did not have telephones. – Ancestry.com and Ancestry Library Edition (available in the library or from home through TryIt! Illinois until November 30). – The Online Historical Directories Website claims to list all online city directories in one place. And if you can’t find city directories for your ancestor’s hometown online, see if a bricks-and-mortar library has a collection of their city’s directories. The Newberry Library has many city directories in their collection. It may be worth a visit! Have you found another source for city directories? Let us know!